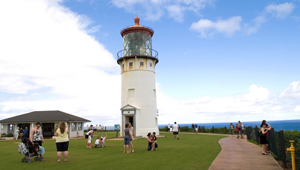 Kilauea Point National Wildlife Refuge has long been considered the best viewing site for Hawai`i's diverse seabird species. More than 450,000 visitors come each year to view threatened and endangered species such as the Laysan albatross, red-footed booby, and Hawaiian monk seal. But in the 1980s, development encroached on the refuge. At one threatened parcel, near Mokolea Point and Crater Hill, harassment by dogs from nearby residences had reduced the survival rate for seabird hatchlings to only 25%. In 1988, TPL purchased the point and nearby Crater Hill and added them to the refuge, doubling its size.